Catching striper on topwater lures on Lake Texoma is my favorite. I like to catch stripers on jigs, slabs, and even live bait, but nothing compares to watching your favorite topwater lure get creamed by a hungry striper. I love that feeling when you are working a topwater lure and you know that at any moment a fish will blow up on it. If you have ever caught stripers on top you know what I am talking about and if not it is something you should try. 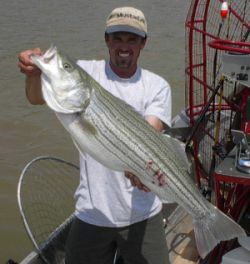 Here is a very simple pattern for catching Texoma stripers on top. Equipment: I use a 6’6 0r 7′ med action rod and you don’t want anything that is to heavy because working a topwater bait can require a lot of rod action and a heavy rod will wear you out. A graphite rod is usually lighter than a fiberglass rod but they are not really that good for bait fishing. I like a rod that will work for all types of fishing so I don’t have to carry a bunch of different rods. The Abu Garcia Workhorse rods are the most versatile rods I have found. They are light ,sensitive, and very strong. 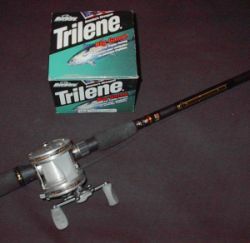 As for a reel you cant go wrong with a Abu Garcia 5500 or 6500 C-3 , if you cant throw a bait caster you can use a spinning reel, loaded up with fresh 12-20 LB Trilene Big Game. Remember to change your line often, it will save you a lot of frustration from lost fish and expensive topwater baits. Fresh line will also improve the performance of your reels. Topwater Baits: When the Bite is really on I don’t think it makes much difference what you throw. If it is windy I like to throw a 6″ Pencil Popper because it is heavy , you can make long casts and it works well in a heavy chop. In light winds I prefer a Mirror Lure Top Dog or Top Dog Jr. Another really good bait is a Storm Rattling Chug Bug in the 3 1/2″ and 4 1/2″ size. I don’t think color matters much but I usually use a shad pattern. The Chug Bugs are probably the easiest to work because all you have to do is pop them. 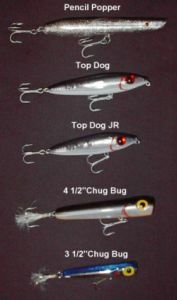 The Pencil Poppers and Top Dogs are a little harder to work because you want to make the bait dart from side to side which is called walking the dog. Where to fish: The key to finding topwater striper in the spring time is to find where the Threadfin Shad are spawning along the shore. The shad are easy to find, just look for the Blue and White Herons wading along the bank. You need to start looking where the wind is blowing the shad up against a point ,rocky bank ,or sand flat. If you see some Herons wading ease up to them and throw right at the bank. If the herons spook easily there is probably not much in that area ,but if they stay and you see them catching shad you are right where you need to be. 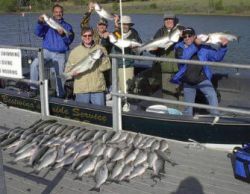 If the fish are really active you cant miss but sometimes you will have to figure out what lure and action works best. Sometimes they want you to stop and just let the lure set still. If a fish strikes your lure don’t set the hook until you feel the fish because they will often swat at a lure several times before eating it and if you set the hook to early you will just pull the bait away from the fish. When a fish first hits my bait I like to stop and just twitch it a little and this will usually draw another strike.